Schmidt M, Bailey M, Kelly J, Hodgson C, Cooper DJ, Scheinkestel C, et al. Intensive care medicine. 2014;40(9):1256-66. 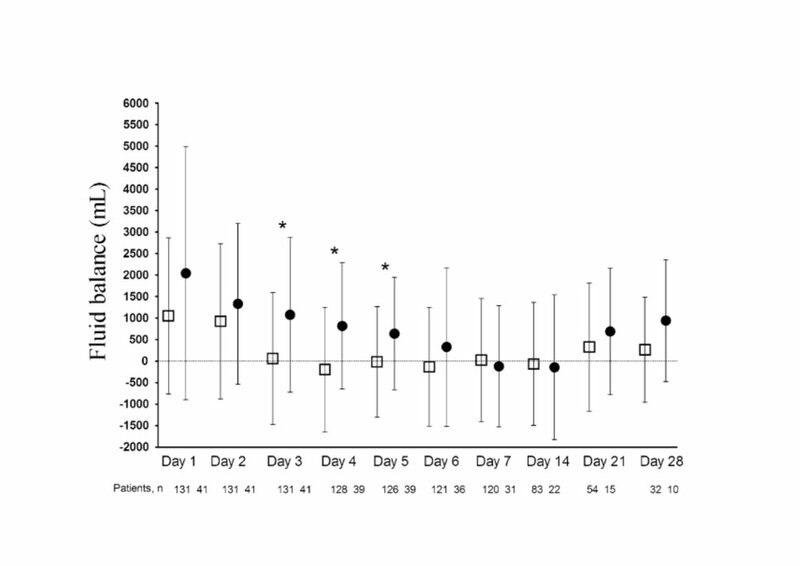 Is early fluid balance status (within the first three days of ECMO initiation) associated with outcome in adult patients? Excluded 21 patients who didn’t survive to day 3, and 2 patients who had incomplete data from referral hospital. Participants assigned to cohorts and analysed according to fluid balance. ECMO patients requiring CRRT are at greater risk of 90-day mortality. Answers a clinically relevant question. Despite reasonable data in children, data on fluid balance in adult ECMO patients is limited. This is the largest study to date in the field, and opens up the need for a multicentre trial. Outcome measures included medium-term survival (including 90 day and hospital survival), and adjusted for important variables such as bleeding events, AKI, CRRT use. Analysis used propensity- scoring to assess positive fluid balance as binomial or continuous variable. Type of fluid administered was not recorded. Authors acknowledge this, but note that starches were not available during the study. Overall this is an excellent study looking at the (surprisingly) previously undefined issue of fluid balance in adult ECMO patients. Early positive fluid balance in adult ECMO patients is associated with worse outcome, which has implications on how aggressively we should be removing fluid in the first days of ECMO support. A prospective, multicentre trial on the issue is certainly warranted.